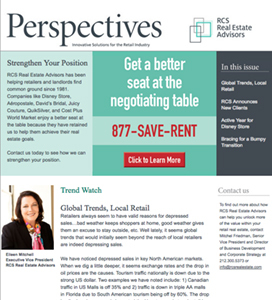 Stay Current With the Latest News About RCS Real Estate Advisors. As the preeminent advisory firm in the retail real estate industry, RCS Real Estate Advisors reports a steady flow of successful client engagements with leading retailers across North America. We’re also actively engaged in industry events and activities that help keep us at the leading edge of retail real estate issues, and frequently share our insights through a variety of communications with clients, including a newsletter prepared by our partners. To see current and past copies of our newsletter, or to learn more about our work and our industry leadership, click on the appropriate item.